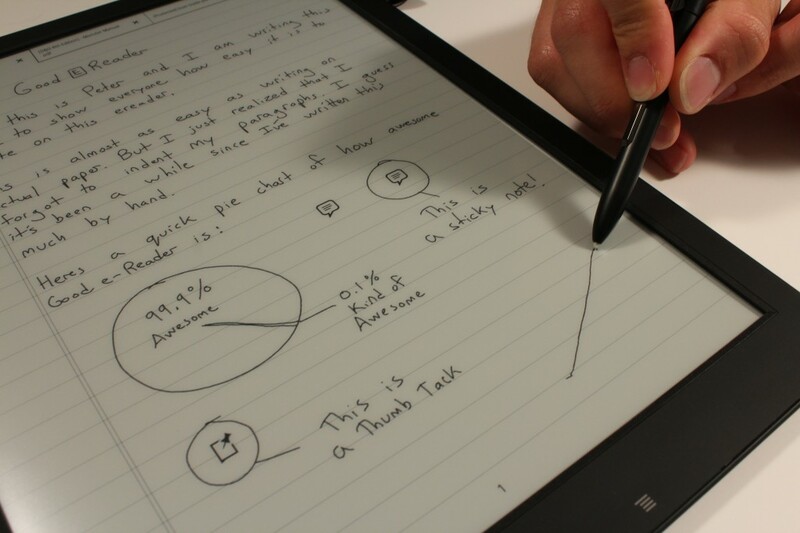 The Sony Digital Paper is experiencing robust sales to industry professionals who demand a large e-paper screen. In order to broaden their reach and scope, Sony has just announced a price reduction on the DPT-S1 from $999 to $799. The Sony Digital Paper originally hit the market one year ago and the intention behind this 13.3 e-reader was establishing a new product category. Instead of being aimed at consumers, like Amazon and Kobo, Sony made the gambit of constructing a device aimed exclusively towards people who need a world class PDF experience. The DPT-S1 Digital Paper was first available at $1200 and higher education, lawyers and people involved in entertainment were the first ones to purchase the device. Once Sony had established an extensive sales record they discounted the price to $999 and started to sell it online to anyone who wanted one. The $799 price point now makes the Digital Paper extremely viable to not only professionals now, but the average consumer. If you pay attention to the e-reader sector you would have inevitably heard of e-ink Mobius. This is a flexible plastic based material that Sony had co-developed with e Ink Holdings. It weights 50% less than your traditional glass based TFT display and despite the 13.3 inch nature of the screen, it weighs less than a 9.7 inch Kindle DX. Sony has pioneered a new market for e-readers and this has spurned their competition into developing new products. Pocketbook is developing a 13.3 inch solution called the CAD, which is aimed at architects and designers who tend to use 3D modeling programs such as Maya or 3D Studio Max. Dasung has developed a 13.3 inch display that was designed to be a secondary screen for a PC and Onyx is in the process of making a commercial version of a 13.3 inch e-reader aimed at people who love reading e-book novels. The price reduction from $999 to $799 is primarily attributed to making the DPT-S1 more accessible. Likely this price will make sense to a lot of people looking for a large screen reader to use in their professional life. Still a bit too pricey for me for something that apparently has a few bugs remaining. US$500 would convince me. 500 would be THE perfect price, but I would not expect another drop until almost the end of the year, maybe September. Sorry, no constructive comment on Sony absurd pricing policy. Only emotions. I have a number of questions that I hope you can answer, either in the comments here or perhaps in a new video. Thanks in advance for taking the time…. a) Are there different highlight colors? b) If so, how many? c) If so, are the different “colors” distinguishable on the screen? a) Can you choose the items to be searched (e.g. the current document, a particular folder, all documents, only comments/stickies in the current document alone, only comments/stickies in a particular folder, only comments/stickies across all files)? b) If so, which of the above options is available? d) Does it have any other search options, such as whole words only, or case-sensitive, or stemming? e) Can you search document titles alone? f) Does it support tagged documents? If so, can the tags be searched? 3) Is there any way to recognize and convert hand-written notes to text, either on the device or after exporting the notes to a PC? some sort of text format (RTF, open office, whatever) or is that possibility utterly precluded because it would require hardware changes? b) If not precluded by the hardware itself, do you have any idea whether there’s any chance that Sony might be thinking of working on a radical firmware/software update like that? Thanks in advance for taking the time to answer these questions. We’re getting closer!! I very much want one of these. Will shopereaders.com follow this further price drop ? I’d love to hear comments regarding those two from owners. I keep imagining using this (at least for reading) mostly before I sleep or traveling which might involve low to no light situations. Without a backlight, I’m guessing it becomes useless in those settings. 1600×1200 sounds good, but many of the papers I read are technical and often around 10 point font. In an era of “retina”-like displays, I’m wondering how crisp the text really will be. I just got mine yesterday. My primary use for the device is reading/annotating scientific journal articles that are in two column format. I’ve never used e-readers before, but thus far I’m not so happy with the readability of said articles on this device because of two issues: insufficient resolution and insufficient contrast (black not black enough and white not white enough). It just seems too faded. Although it seems the contrast increases at very steep (impractical) viewing angles. Perhaps I got a lemon? Again, I don’t have experience with e-readers so I’m not sure. But certainly my journal articles are significantly less readable on this device than a printed sheet of paper under the same light conditions. I am however satisfied with the functionality of the pen for making annotations on the pdfs. At this point I think I will be returning the device. Had it been around $200, I might have been inclined to keep it because of its great annotating abilities and portability. But not at this price. I did the math at one point, and I believe the Sony is about 143 DPI. My guess is that until they can get higher than 200 DPI the readability of fonts for typical journal articles (two-column, 10-11 point fonts) is going to be less than ideal. If this had closer to 300 DPI and had an optional backlight, I’d have bought one of these back when it was still $999. Instead I keep waffling. The strength of the Sony is clearly its software. WebDAV is perfect for me to sync documents, and they’ve clearly put a lot of thought into the pen-based PDF annotation. My fear is that Sony won’t develop this hardware into a next-gen version; cheaper Chinese knock-offs will flood the market, but none will come close in matching Sony’s software capabilities. We’ll be stuck with an outdated Sony Digital Paper with great software; and in its place get a bunch of cheap knock-offs that beat the Sony on hardware specs, but are basically just useless e-readers with no solid PDF capabilities because the software is junk. The M96 has auto crop and text boldening, which the Sony does not currently have. No frontlight on the M96 either though, but it still seems like it would be more useable for two column journal articles than the Sony Digital Paper. I’m actually considering giving the M96 a try. Hi, Mike, on http://noteslate.com there is a hint for a 13 inch alternative: “We are working hard to bring you 13.1-inch device soon”. sent them a general message to find out more. The golden standard for serious articles remains the letter/A4 format in 6-900dpi b/w laser. A well printed article has per page equivalent resolution in the 10-20Mpix, which is order of magnitude above the current crop of 13″ eInk panels, glass or plastic. The rest is contrast and dithering capabilities, vs. battery life and CPU power, OS and rendering s/w. Sony should be applauded for courage and having tried their best with the current low-res einks. W/o wifi display/miracast and backlight it’s rather a niche device for certain low res PDFs (hence their Matlab demo text, coarse text and plots) and pen (a GREAT feature!). Perhaps MS should take it next to their Surface Pro and push the envelope to the next step? Or Apple? I have a feeling that the Sony DPT-S1 could be sufficient (but still not as good as real paper) for two-column journal articles even with the current screen resolution if Sony could solve the contrast problem that I saw for the small text. Some type of enhanced rendering plus a frontlight like some of the smaller ereaders have might do the trick. I agree that Sony should be applauded for their effort with currently available technology, though I have a feeling the software could have been better developed to make smaller text more legible even with the current hardware limitations. The latest firmware update for the Japanese version of the device seems to include some sort of screencasting ability. Including a frontlight (e-readers tend to have “frontlights” rather than backlights) on an e-ink screen this big seems like it would have been technically prohibitive so I don’t blame them for not putting in a light, though I really hope the next generation of the device has a frontlight. And yes, I really was quite impressed with the pen. I personally am not holding my breath for MS or Apple to help out here (but you never know). I think Sony almost has it nailed…just a couple of more years for the technology to mature and they should be there. Even at $499, it’d still need to compete with Onyx Boox M96: Lower res (both anyway are arguably 10x under-DPI-ed), yet Android, 32GB uSD extension, audio/TTS, full set of apps and file support for ePUB, DOCX, PPTX etc. Notably, M96’s PDF reflow and rendering seems more versatile, even if the pen input is certainly inferior to Sony/Wacom’s. Mmm, yeah. I don’t think so. Get it down to $200 or less, and I’m in. Wow, this looks amazing!! I want one. Like most people are comment, the lack of backlight is holding me back. My favorite thing is reading in bed…and i dont want to have to use an external light. Also, i wonder if this has text to speech. I do almost all file transfers by wire. When papers are submitted to me in word processor form, I convert them to pdf on my laptop, then transfer to the Sony. student papers, fiction, and my own publications in separate folders. The battery life is awesome. The machine is durable, despite light weight and thinness. Weeks of holding it in left hand and using stylus in right hand does erode paint from the left edge. It comes with a lot of native memory, and can accommodate an additional standard memory card in a back slot. screen through the keyboard! Plus the battery lasts for a flight of many hours, which a tablet battery may not. that the price will come down further. Incidentally, when I bought mine at $999, it was available only in the United States. Is it sold worldwide now? I am very much inclined to buy this device because of the 13,3” display. As a Humanities scholar I am working a lot with book scans, so the resolution should be fine. However, the file size could be a limitation. Some of my files easily get to 20 or 30 MB. Can the reader handle that, even with annotations, say on every page? And – how does the export work? Can you really see the annotations on all other devices with normal PDF readers? Because that is something that is really annoying with the PRS series, that you can export the annotations only to a RTF file. Those are “small” files. Most of the things we tested were like 200 MB, and they worked more than fine. And how about exporting annotated files to other devices? Do you have any experience with that? Can you easily continue working on them? I have the same concern you do. In my mind, Sony needs to create a second gen device with more processing power and access to android apps. My understanding is that they already use a (very old) Android kernel. The lack of support for anything other than pdf docs is ludicrous. I would buy without hesitation if it meant I could read pdf, ebooks, word and excel files. Looks like they aren’t planning a follow up any time soon, as they seem to be doubling down on marketing for the current version at the moment. Can I order the Sony DPTS1 to Germany ?